Politicians have been sticking it to the people for years. But voters have been sticking it to politicians for just as long, albeit in a much kinder way: by wearing presidential campaign buttons. The pin-back political button as we know it first showed up in the 1896 presidential race, when Republican William McKinley and Democrat William Jennings Bryan locked horns. 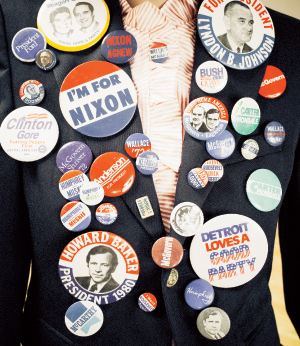 Since then, collectors have been amassing buttons from all manner of candidates and parties. With Michigan sizing up to be a battleground state in November, Obama and McCain buttons promise to be prevalent in almost equal numbers. A classic “swing state,” Michigan isn’t consistently red or blue. Of course, there were political artifacts before 1896, including ribbons, medals, posters, and clothing buttons, but the pin-back button remains the most common political souvenir. They’re swapped and auctioned at shows and conventions and bid over on eBay with evangelical zeal. There’s even an organization, the American Political Items Collectors (APIC), where dealers and collectors can network. Members of the group, which started in 1945, also receive catalogs and newsletters. There have been scads of presidential buttons produced since 1896, but age alone doesn’t necessarily translate to value, says Bren T. Price Sr., an APIC member who’s been collecting political memorabilia since 1972. He sells buttons on his Web site (politicalbanner.com) as well as on eBay and at political memorabilia shows. Like any form of collecting, there’s the Holy Grail, the elusive, extremely rare item that brings out the bloodhound in collectors. For political-button zealots, that honor goes to the Democratic ticket of 1920: presidential contender James M. Cox, and his then relatively unknown vice-president hopeful, Franklin Delano Roosevelt. Not bad for a duo who were trounced by the Republican Harding-Coolidge juggernaut at the polls. But Roosevelt would get his revenge by being elected president in 1932 — and 1936, 1940, and 1944. But what about the value of pins with candidates who made a run for the nation’s top job, but weren’t nominated? “That really is subject to who the personality was,” Price says. “Some of them had a mystique about them. Eugene McCarthy [who garnered fame as a Democratic anti-war candidate in 1968] is one. There’s a huge group of McCarthy fans,” Price says. But he says other “hopeful” candidates generate minor interest, such as Mo Udall, who made a bid for president in 1976. The same charismatic rule holds true for third-party candidates, Price says. Pins of the ultra right-wing team of George Wallace and Curtis LeMay, the American Independent Party candidates in 1968, hold little allure. But another Wallace on the opposite end of the political spectrum — Henry Wallace, the Progressive Party’s hopeful in 1948 — is “really hot,” Price notes. For a beginner, collecting political buttons is quite accessible, with many items going for a few dollars up to $20. Still, Price has a few suggestions for the novice. Price also suggests trolling around on eBay. But doesn’t that leave the inexperienced collector open to getting burned by buying a repro? 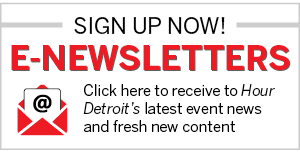 Bulanda is the managing editor of Hour Detroit. E-mail: georgeb@hourdetroit.com.